You need to transfer contacts from old iPhone to new iPhone XR/XS Max/XS if you upgraded your old iPhone to a new one. The article shows 3 simple methods to transfer contacts from old iPhone to new iPhone XR/XS Max/XS. Did you recently upgrade your old iPhone to a new one, like iPhone XS/XS Max or iPhone XR? Then you must be looking for a convenient method to transfer contacts from old iPhone to new iPhone XR/XS Max/XS. Today we list three simple methods to make it. You can go through these methods and select the best one as per your preferences. If you are looking for the simplest way to transfer contacts from old iPhone to new iPhone XR/XS Max/XS. IOTransfer would be exactly the tool you must try. It is a user-friendly iPhone transfer enabling you to transfer voice memos, videos, music, apps, etc. between iOS devices and PC. Besides, it can be used as an easy video downloader, video converter, GIF maker, and much more. Now, follow the two parts below to transfer your contacts in a minute. Step 1. Free download IOTransfer here and install it to your Windows 7/8/8.1/10. It works in iOS 8 or later. If you have updated to iOS 12, you can also transfer files with it. Step 2. Launch IOTransfer and connect your old iPhone to PC with a USB. Then go to “MANAGE” > “Contacts” > “Select All” > “Export” to choose the transfer location and then click “OK” to start transferring them to computer. Or you can select some of them to transfer. After successfully exporting the contacts from your old iPhone to computer, follow the steps below to transfer them to your new iPhone. Step 1. Disconnect your old iPhone and connect the new iOS device to computer. Then this tool will recognize your new iPhone XR/XS Max/XS. Step 2. As in the previous step, go to “MANAGE” > “Contacts” > “Import” to choose contacts you have already transferred from old iPhone to PC. Then click “Open” to start transferring them to your new iPhone. After that, you can check the contacts on your new iPhone. If you are setting up your new iPhone XR/XS Max/XS for the first time, you can select this method to transfer contacts from old iPhone to new iPhone. However, it is important to keep in mind that iTunes backup would transfer all the other data along with contacts to the new device. First you need to learn How to Backup iPhone Contacts to iTunes, that will help you backup all your contacts on your old iPhone. After that, you will have to restore contacts from iTunes backup to your new iPhone. Connect the new iPhone to computer through USB and go through the same process to restore backed up information including your iPhone contacts. Then go to iCloud in Settings. 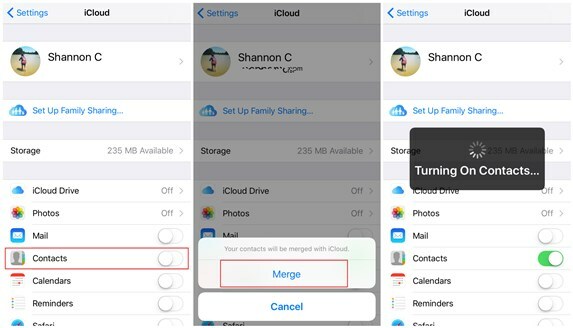 You need to switch on“Contacts”and choose "Merge", then your contacts on old iPhone will be synced to iCloud. Make sure log into iCloud on your iPhone with the same Apple ID on your new iPhone, tap on "Restore from iCloud Backup" and the contacts will be synced to your new iPhone. It will take a couple of minutes for the restoration process to complete, which is based on your Internet speed. You can transfer contacts from old iPhone to new iPhone XR/XS Max/XS with the above three methods. However, the method 2 and 3 will transfer the files you no longer need from your old iPhone. Therefore, I’d prefer to use IOTransfer as it can allow me to transfer various files like videos, apps, videos, voice memos, etc. from iPhone to PC as I like. Also, I can wirelessly transfer files with it.